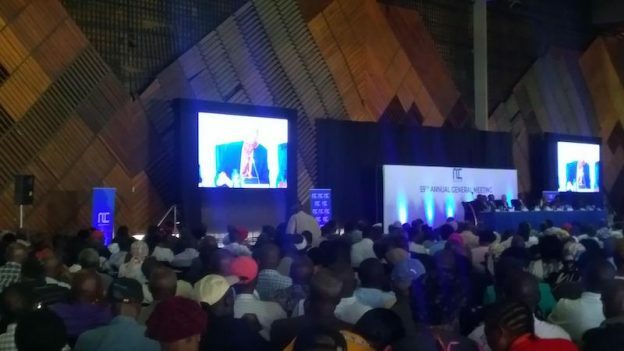 NIC Bank shareholders met for their 2019 annual general meeting and approved a merger with CBA bank, creating Kenya’s second-largest bank (by customer deposits), a day after CBA shareholders had approved the same deal. The merged bank will have about a 10% share of banking assets, deposits, and loans in Kenya. 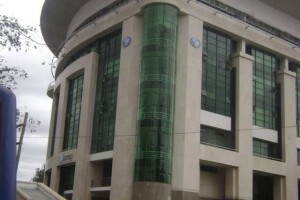 It will encompass the two groups serving over 41 million customers and their banking entities in Kenya, insurance (CBA Insurance and NIC Insurance), investment banking & stockbroking (CBA Capital, NIC Capital, NIC Securities), and regional subsidiaries in Tanzania (both banks), Uganda, (both banks) and Rwanda (CBA) and Côte d’Ivoire where MoMoKash is a CBA partnership with MTN and Bridge Group. Group Managing Director John Gachora said scale is important in banking and that by merging NIC, which is known for asset finance and corporate banking, with CBA, which has desirable mobile banking and high net worth businesses, they would be the largest bank by customer numbers in Africa. CBA will be 53% shareholders in the merged bank. NIC turns 60 this year, and in 2019, their focus will be on getting to Tier I ranking through the merger, and getting regulatory approvals after they had obtained shareholder approvals. Directors also got approval to effect a name change (already under consideration) and the right to dispose of up to 10% of the assets of the bank without reverting back to shareholders. They will also create an employee share option program (ESOP) to retain key staff, and CBA, who already have an ESOP for their veteran staff (that owns 2.5% of that bank), will fold itself into the new incentive scheme. Other conditions of the merger include obtaining a waiver of capital gains and stamp duty tax in Kenya, approval of regulators in different countries, and approval of landlords and financial partners. This entry was posted in AGM, CBA, East African Community, ESOP, M&A, NIC, NSE investor awareness on April 17, 2019 by bankelele. The boards of NIC and CBA banks confirmed their plans to go ahead with a merger to create the largest bank in Africa by customer numbers. Serving over 40 million customers in 5 countries, the combined entity will have Kshs 444 billion in assets (~ $4.4 billion). Currently, they are both at 115 billion of loans and have differences in deposits with 145 billion at NIC to 191 billion at CBA and customer numbers of 142,000 at NIC to 41 million at CBA. They had relatively similar customer numbers prior to CBA’s launch of M-Shwari in partnership with Safaricom. Going forward they aim to obtain shareholder approval in Q1, obtain regulatory approval in Q2 and have the new entity commence operations in Q3 of 2019. Currently, NIC has 26,000 shareholders and is listed on the Nairobi Securities Exchange (NSE) while CBA has 34 shareholders (20 individual, 14 corporations) including Enke Investments (24.91%), Ropat Nominees (22.50%), Livingstone Registrars (19.90%) and Yana Investments (11.14%). The merger will be effected through share swaps that will result in NIC shareholders owning 47% and CBA shareholders 53% of the new entity whose shares will remain listed on the NSE. MCB in Kenya: Leading Mauritius Lender MCB Group has officially opened its representative office in Nairobi. The largest and oldest bank in Mauritius, with $12 billion in assets and a presence in nine countries, it had been licensed in Kenya back in 2015 and it will bank on its new office to gauge opportunities in the Kenyan market and build strategic relationships. The 19th largest bank in Africa by assets, it is listed in Mauritius and has 19,000 shareholders. It has a strategic objective of growing its international footprint and expanding non bank activities. It has 1 million customers, 3,500 employees and 55 branches but, as it was communicated at the launch, they have no intention of opening branches in Kenya or East Africa. Ethiopia Bank summary: Asoko Insight gave a summary report of the Ethiopian banking sector, parts of which are only available to subscribers. While some foreign investment is expected in Ethiopia, the banking sector is already privatized with fifteen of the country’s eighteen banks all having private local owners. The state-owned Commercial Bank of Ethiopia is the largest bank in the East Africa region with 1,280 branches and earns 67% of the sector profits in the country. It has revenue of $1.3 billion, while 11 (other) banks, have revenues of between $50 million and $500 million, suggesting a more concentrated market in terms of size. Tanzania: NMB bank has waived several bank charges for their customers from February 1 including account opening, monthly maintenance, transaction fees, dormant account reactivation, and internal transfers – all in a bid to promote finance inclusion in the country. The Court accepted the agreement, convicted and gave the sentence of the sh 64.5 million, sh 24.5 million of which will be restituted back to NYS. Failure to honor the plea barging agreement will result in attachment of Family Bank properties. This entry was posted in CBA, Diamond Trust, East African Community, Ethiopia, Family Finance, Investing in Kenya, Mauritius, NIC on February 5, 2019 by bankelele. Following an earlier ranking of the top banks based on their asset size at the beginning of the year, what are Kenya’s top banks likely to be, nominally based on asset size at the end of the year? In 2018, Interest rate caps and IFRS9 have had an impact on bank performance while the departures of Imperial and Chase banks were announced. 1. KCB Group – Kenya bank assets of Kshs 594 billion assets (and group assets of Kshs 684 billion). 2. Equity – Kenya bank assets of Kshs 424 billion (and group assets of Kshs 560 billion). * 3 CBA/NIC – combined assets of Kshs 425 billion (as at September 2018) – if an announced merger deal is approved and completed. CBA and NIC are ranked 9 and 10 by assets, and will leap-frog Cooperative Bank, Barclays Kenya, Diamond Trust, Standard Chartered Kenya, Stanbic and Investment & Mortgages (I&M) banks. 4. Co-op Bank Kenya – asses of Kshs 398 billion. 12. State-owned National Bank is in search of a shareholder deal to boost capital. 15. SBM Kenya. The State Bank of Mauritius completed a carve-out and rebranding of assets, staff, branches and customers of Chase Bank in August. For the third quarter of 2018, it reported assets of Kshs 75.5 billion up from 11.7 billion in January 2018. It now has customer loans of Kshs 12.4 billion, customer deposits of Kshs 53.6 billion, and government securities of Kshs 34.8 billion. SBM entered Kenya two years ago by taking over Fidelity Bank that had assets of Kshs 15 billion in 2015 for just $1. KCB also is expected to conclude a takeover deal for collapsed Imperial Bank in 2019. 39. Mayfair Bank was licensed to operate in June 2017 and began operations later in August. Mayfair now has Kshs 5.3 billion in assets and operates three branches in Nairobi and Mombasa. 41 Dubai Islamic Bank – Kenya (DIB Kenya) with Kshs 4.1 billion in assets was licensed in April 2017. It, is the third Shariah-only bank in Kenya, after Gulf African (No. 23 with Kshs 32 billion of assets) and First Community (No. 31 with Kshs 16 billion assets). DIB Kenya is a fully-owned subsidiary of Dubai Islamic Bank which is one of the largest Islamic banks in the world. This entry was posted in Bank rankings, CBA, Chase Bank, DIB Kenya, Investing in Kenya, Mayfair, NIC, SBM, shariah banking on December 31, 2018 by bankelele. Jan 31, 2019 The boards of NIC and CBA have agreed to the merger and provided further details of the deal in Nairobi. Dec 6, 2018 The boards of NIC Group and Commercial Bank of Africa have announced preliminary plans to merge. This follows talks that had been reported as far back as January 2015. The move is driven by a need to consolidate capital and liquidity with new technology opportunities to provide more services to customers and grow returns for shareholders. The merger of the eight and ninth largest banks in the country will result in a banking institution that will be the second or third largest by assets, behind KCB and Equity. As of September 2018, NIC and CBA had a combined asset base of Kshs 443 billion ($4.3 billion) and Kshs 9.3 billion in pre-tax profits. CBA is already the largest bank by customer numbers thanks to M-Shwari, its partnership with Safaricom’s M-Pesa that had over 21 million customers last year. More details will come later and NIC is listed on the Nairobi Securities Exchange. This entry was posted in Basel II, CBA, Investing in Kenya, M-Shwari, NIC, NSE investor awareness on December 6, 2018 by bankelele. EDIT July 27: Seaboard announced they are waiving the minimum acceptance threshold and will proceed to complete the acquisition of shares for which acceptances had been received and those shareholders will be paid Kshs 40 per share in cash. Seaboard still intends to seek a de-listing of Unga from the NSE and will convene an extraordinary general meeting “in due course”. EDIT July 20: Official results of the offer, saw Seaboard increase its shareholding from 2.92% to 18.97%, and combined with the 50.93% of Victus, they now control 69.9% of Unga’s shareholding. Other shareholders own 30.1% but 8.16% of them did not respond to the offer and Seaboard who had a target to attain 75% in order to push for a de-listing of Unga from the Nairobi Securities Exchange will make further announcements. EDIT June 14: Seaboard Corporation has received regulatory approval from the Capital Markets Authority (CMA) to extend its offer to buy the minority shares in Unga Plc by another 10 days.. to 5.00pm, Thursday 28th June. “During the offer period, Seaboard received numerous queries from Unga Plc shareholders with requests for resubmission of the offer documents that were originally dispatched to them via post by the Registrars. This is primarily attributed to the change in postal addresses and/or relocation of shareholders whose new details are not updated with the Central Depository and Settlement Corporation”. May 30: Today sees the start of an offer period by Seaboard Corporation, acting in conjunction with Victus Limited, to buy out other shareholders of Unga Group PLC and to de-list the company from the Nairobi Securities Exchange. Seaboard: The company which states it is on the Fortune 500 list, was incorporated in 1908, and is registered in Delaware and headquartered in Kansas. It had $5.8 billion revenue and $427 million profit in 2017 and is involved in marine, pork, commodity trading and milling (where Unga is), sugar and power industries. Seaboard owns 2.92% of Unga and also 35% of Unga Holdings, a subsidiary of Unga (who own the other 65%) and which comprises the flour milling and animal feed operations of Unga. Seaboard is joined in the Unga buyout deal by Victus which owns 50.93% of Unga shares. 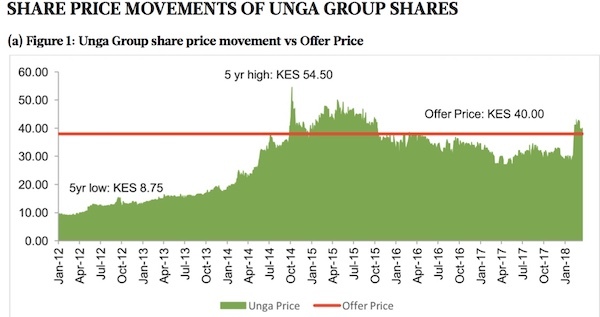 Offer Price: Over the last year, Unga’s shares have traded at between Kshs 30 and Kshs 32 and they briefly rose to Kshs 60 after the offer was announced in February but are now settled at ~Kshs 42 per share. Contained in the documents to shareholders, CBA Capital confirms that Seaboard has enough funds at Citi (bank) to complete the offer and to pay all shareholders in full at the offered price – which will amount to a cash payment of Kshs 1.4 billion (~ $14 million). Payments will be by M-pesa, cheque, or bank RTGS/EFT (for amounts over Kshs 1 million). From publicly listed to privately held: Their target is to get 90% acceptance, but if they get 75% they may push on with the plan toward delisting, as they caution that any shareholders who hold out and don’t sell their shares, may find it harder to trade them in future. The offer to Unga shareholders opens 30 May and runs through to 13 June, after which the shares will be suspended till the end of June, ahead of a results announcement on July 2. Firm Price? They have reached out to other large shareholders in Unga who own about 15% of the company shares. June 6 is the final day for Seaboard to vary the offer and if they do so all shareholders will benefit from the new price. But already there is a report that they have ruled out increasing their bid, saying they will be no change to the offered price unless a competing bid arises. Of note is that one of the large investors at Unga is a company which emerged to mount one of the competing bids at Rea Vipingo that resulted in the initial buyout promoter raising their eventual payment to Vipingo shareholders. Board recommendation: The offer documents value the shares using the income approach at Kshs 39.82 per share, at Kshs 39.01 using the market approach and at Kshs 62.04 using the asset approach. Seaboard is offering Kshs 40 and the members of the Unga board not linked with the promoters (3 of the 8 directors recused themselves) have recommended that Unga shareholders accept this price which is based on independence advice from Faida Investment Bank. Transaction Advisors: Besides CBA Capital which are the fiscal advisors and sponsoring stockbrokers, CBA is the paying bank, while other local firms in the Seaboard deal are Kaplan & Stratton (legal advisors), Oxygene for public relations and CRS are still the share registrars. The promoters hope to conclude the deal by September 30. This entry was posted in CBA, M&A, maize, NSE insiders, NSE investments, NSE investor awareness, Unga and tagged Unga on May 30, 2018 by bankelele.